From the interstates, this will be the view of the finished solar farm. 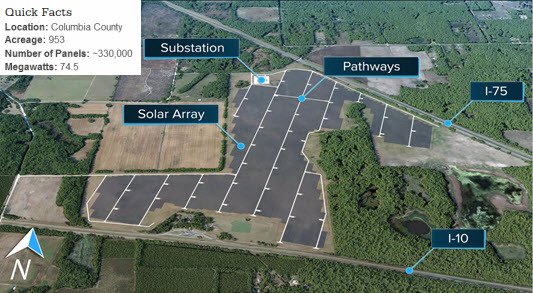 COLUMBIA COUNTY, FL – Florida Power & Light’s solar farm is under construction along I-75 and I-10 in Columbia County. Also called a solar plant, the Columbia County site will generates zero-emissions and enough electricity to power approximately 15,000 homes and the emissions and carbon removal are equivalent to removing approximately 12,000 cars from the road. • Read more about the Columbia County project here. According to FPL, it delivers electricity that is cleaner and more reliable than ever before, for a cost that is lower than it was more than a decade ago. This year, FPL is constructing nearly 600 megawatts across eight new solar sites. Artists rendering of the Columbia County solar farm. FPL’s solar energy centers are virtually silent, require no water for operation or maintenance, and solar arrays sit low to the ground. A solar center does not require staff to operate and won’t bring more traffic to the area after construction. It takes six to eight months to construct an FPL solar farm. The Columbia County Solar Energy Center is generating about 200 jobs during construction.